This approach goes beyond the direct costs related to making the art. It makes you think about all those other costs that a professional artist aiming to make a living from their art will need to recover and/or pay somehow – or go out of business. = YOUR TAKE HOME PAY generated by the sale of art! The latter is the equivalent to a pay packet in a conventional job where the employer deducts tax at source. It’s the sum earned from the sale that you can actually spend on stuff that isn't connected with making art e.g. such as buying food and paying rent for your home. It's a proxy - but it's also an eye-opener! To arrive at a realistic notion of your hourly wage, you can your divide your profit by the number of hours you took to create the work.. So – that’s the overview. Now we do it slowly and unpick pit by bit. I've split out all expenses incurred from all expenses allowed for tax purposes. ​This enables a review of what is/is not allowed as an allowable expense (or a tax allowance) in the current tax year. Note: This isn't strictly accurate for proper accounts or doing accounts for the tax man (i.e. I'm ignoring all the little technical and allowable tweaks which are available) - but it gets you to a realistic figure re. profit from the perspective of managing your art business. ​DIRECT COSTS are the costs specifically associated with the artwork you produced. Direct costs are variable in the sense you don’t incur them unless you actually use art media and supports. For the purposes of this calculation we’ll assume you buy in just enough for the artwork produced – and ignore the stock of at materials that are sitting on the shelves. 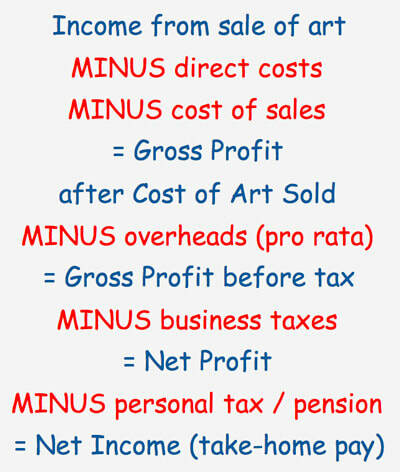 This is the figure many artists may think of as profit - and yet it's a very long way short of real profit! If you find yourself going out of business, then this is probably why. ​STEP 3: NEXT WORK OUT YOUR "COST OF SALES"
Deduct any specific "cost of sales" items that are unrelated to price or size (eg advertising; entry fees; cost of printing catalogues; transport/courier etc). You might want to share these across however many other artworks they cover - but be realistic about how many you actually expect to sell. Deduct the cost of matting/framing. You might reuse frames and mats - in which case determine the replacement cost in the case of a sale as the deduction. Fixed costs are the costs which keep on accumulating even when you're not making art. They don't stop when you take time off or go into hospital or on holiday. Next step - divide your fixed costs by an estimate of the number of works (or units) you sell each year and deduct the proportionate share. This is much easier to work out if you typically produce work that is all the same size. this is what drives the cashflow until such time as you get the benefit of the expenses you can set off against tax. your working capital requirement may well grow as you grow your business - so don't forget to keep a close eye on this number. This is where getting help from a tax adviser with what is and is NOT allowed can be very helpful. Advice from experienced artists who understand their tax accounts and what you can get deductions for can be helpful – but always double check advice from artists as they can sometimes have very curious ideas as to what’s allowed. The last deduction of all are the relevant financial outgoings due from the business e.g. payment of all relevant business taxes (i.e. NOT personal tax - you are not your business). ALWAYS Remember that every country's tax system is unique and what applies in one country might not count in another. = NET INCOME which you get to spend on you - and your rent and food etc! This is how much money you really made from the sale of that artwork!